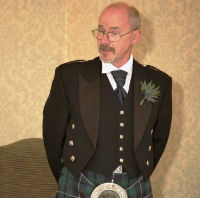 These lines are from a well-known traditional Scottish song ‘’The Road to the Isles’’ describing a weary travellers’ journey and the long road he must travel to reach his home on the Isle of Skye. 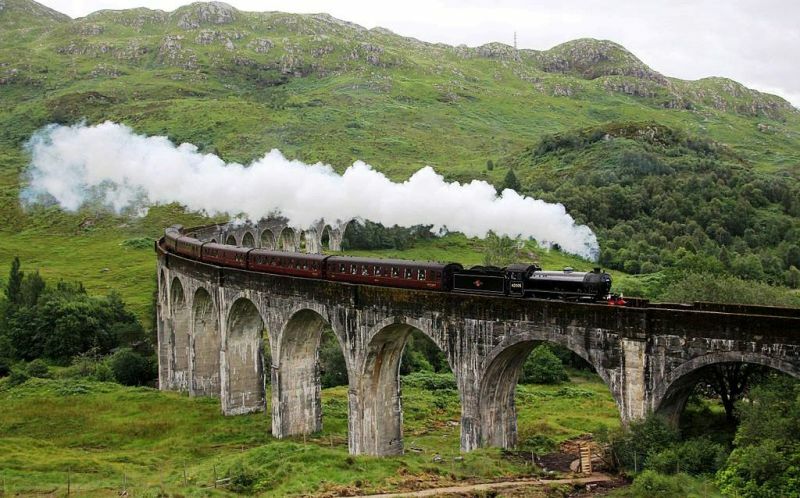 Today that journey is far easier and perhaps the best way to see what is surely the most scenic part of that long road home is to take a different kind of track – a railroad track – from the west highland town of Fort William to the west coast fishing port and ferry terminal of Mallaig. 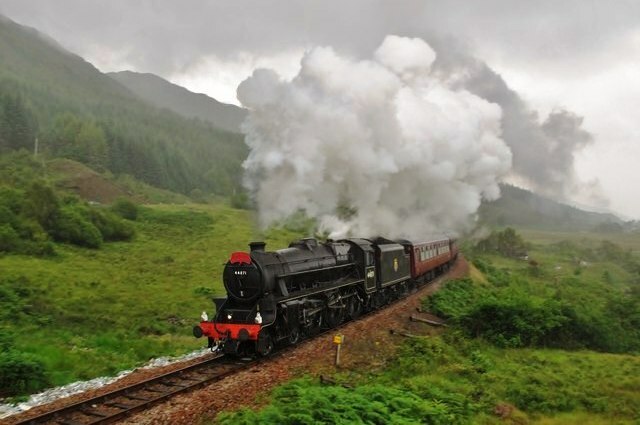 The West Coast Railways Jacobite steam train will take you in comfort from the foot of Britain’s highest mountain to the mouth of Europe’s deepest sea loch. 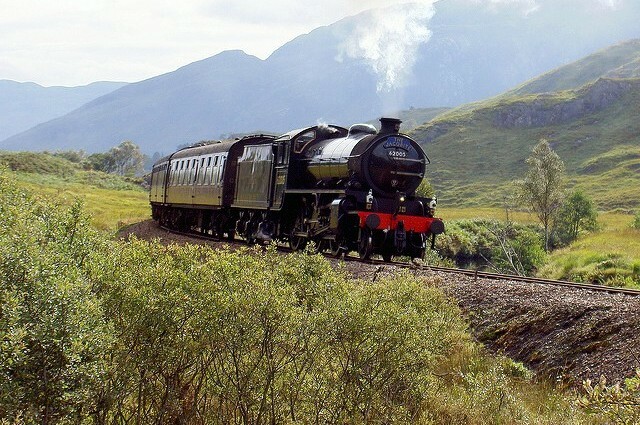 The only timetabled steam rail journey in the UK, the Jacobite passes picturesque coasts, mountains and glens on its spectacular 42-mile journey west. It passes through an area which many consider to be one of the most beautiful in the UK (beaches in this area have been used in several Hollywood movies). From Fort William and Ben Nevis (the highest mountain in the UK) it passes the southern end of the Caledonian Canal and Neptune’s Staircase, a series of eight locks (the longest staircase lock in the UK) allowing boats down to the sea at Loch Linnhe. It then skirts the head of Loch Shiel with its monument commemorating the spot where Bonnie Prince Charlie raised his standard to begin the ‘45 rebellion and passes over the imposing 21-arch Glenfinnan Viaduct (which any ‘’Harry Potter’’ fan will instantly recognise) and on to the small hamlet of Lochailort where commandos were trained during WW2. Next comes Loch nan Uamh where there is another viaduct to carry the railway over the road and, on the shores of the loch, sits the Prince’s Cairn which marks the spot from where Bonnie Prince Charlie fled to France after the Jacobite army’s final disastrous defeat at the battle of Culloden in 1746. A short distance further on is the village of Arisaig – another place involved in commando training and from where emigrants sailed to Canada and founded the small village of Arisaig in Nova Scotia in 1785. Mallaig isn’t far now but before the Jacobite reaches it you can indulge in a little monster-spotting! Loch Morar, to the east of the railway line, is the deepest freshwater loch in the British Isles and is rumoured to have a rival to Nessie, the Loch Ness monster. Named ‘’Morag’’ the Loch Morar monster, is just as much an enigma as Nessie. She has (allegedly) been seen several times but no evidence has ever been found for her existence. Maybe she and Nessie have eloped together! Finally Mallaig at the end of the railway line is reached but that isn’t necessarily the end of your journey. Mallaig (once the busiest herring port in Europe) is a bustling ferry terminal as well as a busy fishing port and onward travel by ferry is possible to the Isle of Skye, the inner hebridean archipelago of the Small Isles (one of Scotland’s National Scenic Areas) or south to Inverie a village on the mainland which isn’t connected to the rest of Scotland by any road (and is home to Britain’s remotest pub). The only way to reach it is by ferry from Mallaig – or a long 17-mile hike over the hills! 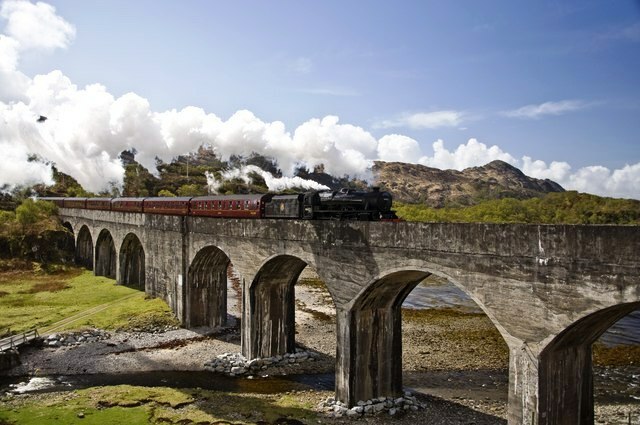 As scenic railway journeys go this ‘’railroad to the isles’’ certainly ranks up there with the best of them and any visit to the west coast of Scotland would be incomplete without a trip on the Jacobite steam train to Mallaig but book early because it is understandably very popular!